So I had a ninety minute ride today, the weather was absolutely beautiful. 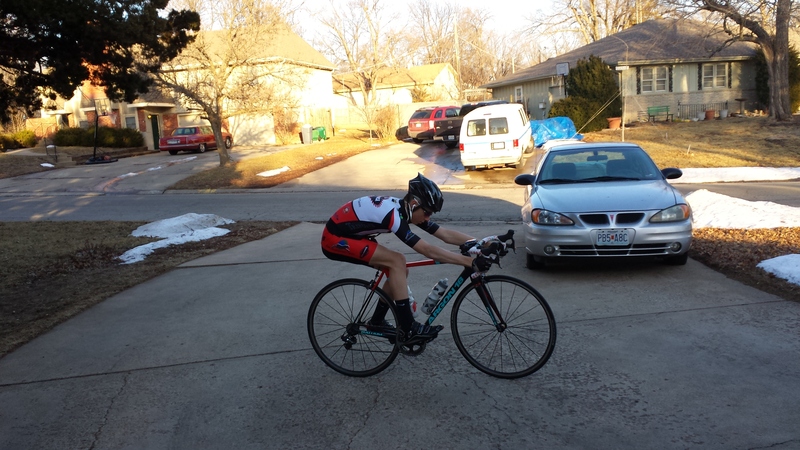 I figured I would throw on the old skin suit, just because it was such a short ride and why not be aero? I didn’t have any intervals today so I just rode around and had fun with my ride. I like to use these days to test my bike handling skills and to see what I can do. It’s really fun to just mess around on the bike, which is why I love riding so much. Anyways, the ride was a bit windy and there was still a little wash out every now and again that I had to contend with but all in all it was a good ride. I hit a tail wind section and I got tucked into a really aero position and I just let the wind push me, I was doing like 25 mph it was awesome. That is until I got the head wind and of course I got it coming home. I would rather have the tail wind coming home when I am tired and get the head wind when I am fresh, its just easier mentally. So I have one more day until I am in AZ and I am so pumped, its going to be so freaking cool. I have a really good feeling about this season and can’t wait to get it started.